I’m in just about the best place right now to write my last entry from India. 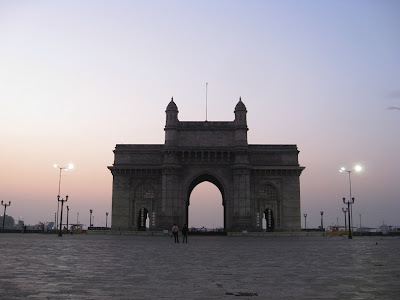 It’s 6.30am and having arrived from Jalgaon two hours ago I’ve made my way to the Gateway of India for a pre-dawn view and it’s beautiful here. There are a few other people about - what’s their excuse for being up at this hour on a Sunday? - but the sun’s coming up and all is very well indeed. I fly tonight from Mumbai International and by tomorrow morning - all going well - I’ll be in Africa, Morocco to be specific, in just about the only part of northern Africa that isn’t kicking off at this moment in time and which is, fortunately, one of the more stable countries in the region. This gets even better - as I’m sitting here waiting for the sun to rise, I have some chai-wallahs bringing me chai without having to move an inch. Two and a half months in India then, much ground covered and I’ve seen everything that I wanted to. Hard to pick out favourites - Udaipur was a beautiful city, the Sikh hospitality experience in Amritsar’s Golden Temple was unforgettable, Jaisalmer will be remembered for its fort and Christmas Day on a camel in the desert, the Taj Mahal, meeting some wonderful Tibetan folk in the beautiful surrounds of McLeod Ganj, Varanasi’s ghats, the freaky meditation course, Chandigarh’s trippy Rock Garden, chilling out in Pushkar with the hippies and crusties, the shipyards of Kutch……I could go on. But Africa I hope will be a different rush - a travelling buzz, the hassles of crossing borders and getting from place to place. I have a vague itinerary which sees me begin in Morocco, make my way overland down through Western Sahara and Mauritania. There’s an iron ore train which you can jump on in northern Mauritania which is 2.5km in length and has one passenger carriage at the end which takes twelve hours to bring you to the next city in Mauritania. From there I’ll spend some time travelling around Senegal and then across to Mali where, time permitting I’ll get to Timbuktu (it isn‘t a name your parents made up when you were a kid) and trek in Dogon country amongst the Dogon tribes people and finish up in Burkina Faso. I have no idea if two months is long enough to do all of this - Africa, no doubt, will devour even the loosest of schedules but I’m very excited about getting there and giving it a go.  You are here alone? And so it goes. In fact you could bump up the virgin question closer to the top. On occasion it’s seemed as if the only reason an Indian guy has approached me is to ask me if I’m a virgin. Anyway, the sun’s about to rise and my time here is literally done.